The middle school’s student-run bookstore, The Tattered Pages, had a successful season this year with its Sixth Annual Holiday Shopping Extravaganza. 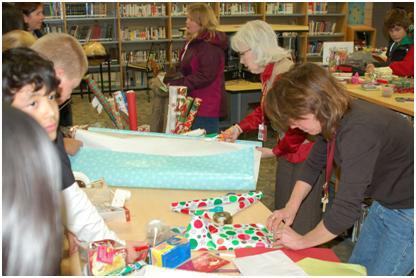 More than 1,500 books and other donated items were purchased by middle school students to give as gifts to family and friends, according to media center staff. During the kick-off event and for several days in December, students used specially earned coupons to purchase holiday gifts instead of spending money. Coupons were earned in a variety of ways, such as donating books, working in the bookstore and completing volunteer tasks around the building. The event includes free giftwrapping, so most customers left that evening with their gifts ready for presentation, said Media Specialist Amy Sieve.